When setting up a payment profile in your Mediavine dashboard, you'll be asked to fill out a tax form. Our partner Tipalti offers a guided tax form wizard to help you choose the correct form based on country and business structure, which in turn helps Mediavine automatically issue 1099 and 1042 Forms. How do I choose a tax form? You'll need to set up a Payment Profile in your Mediavine dashboard first. Here's how. We have a guide to choosing the right one for you right here! What are the tax documents? You are given the option to choose from the following forms. Click through for a description from the Internal Revenue Service. Keep in mind that if you're paid in the country in which you reside, you will be paid in that country's currency due to the way eChecks work. You are able to change the country you're paid in (which doesn't have to match your residence). Tipalti offers a "tax form questionnaire" that will help you choose a form based on whether you live in the United States and whether you conduct business in the United States. 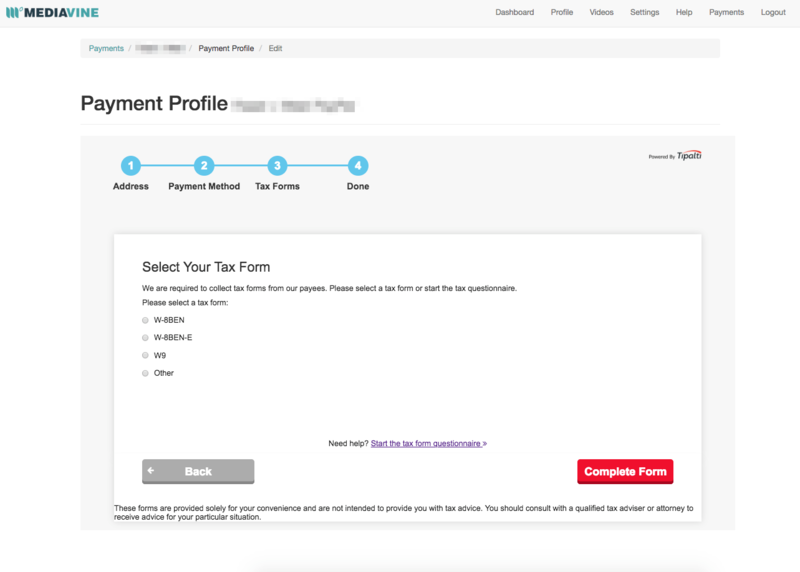 You can find a link to it at the bottom of the "Select your tax form" screen when setting up your Payment Profile. Mediavine cannot provide tax advice, and we recommend you contact an accountant if you have further questions. Tell me about the 8233 Tax Form. You may be prompted to fill out the 8233 Tax Form if you reside outside the United States. The 8233 form should be completed if you are receiving compensation for personal services performed in the U.S. for which you are claiming a treaty benefit. For help filling out the 8233 form, please see these instructions. This form must be downloaded, completed manually and uploaded back to the dashboard. This sometimes happens if the incorrect form is selected. Please make sure you are completing the correct form for your unique situation. We recommend working with an accountant. Will I receive a 1099 or 1042 Form? Good question! We have just the guide for you. You can get in touch via the chat bubble in the corner of your browser, or you can email us at payments@mediavine.com! Please consult an accountant if you have questions about specific tax forms.